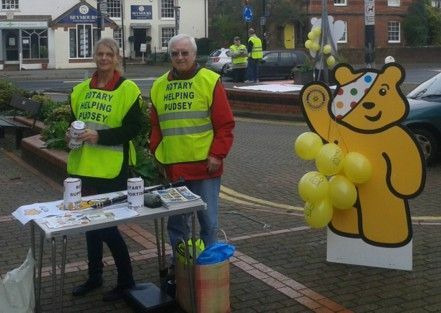 Rotarians from Cranleigh went the extra mile on 15 November as they raised £700 in just three hours for Children in Need. Members of the club invited passers-by to place coins around the sculpture outside the village hall - creating a chain a mile in length. Dozens of villagers stopped to add a coin to the circular chain or donate via a collectiion box. John Menlove, president of the Rotary Club of Cranleigh, said: "It was a great result, which far exceeded our expectations. The people of Cranleigh have once again demonstrated their generosity by contributing to such a good cause." Cranleigh Rotarians also helped at the Children in Need appeal at Gatwick Airport, raising £8,500. This meant that Rotary District 1250 in Surrey and West Sussex was able to make a significant contribution towards this year's national Rotary target of £100,000.